This statue depicts the Greek God Poseidon atop a gilt lined seashell chariot, pulled by a pair of fiery seahorses. It has a beautiful metallic bronze finish to give it the look of bronze, and has hand-painted accents to give it that extra accent. The statue stands 9 1/2 inches tall, is 9 inches wide and 6 1/4 inches deep. 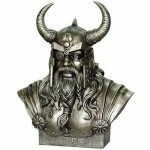 Made of cold cast resin, it has the look of bronze, and shows incredible detail. Item Number: PT-8438 | Approximate Size (Inches): 9.00 wide x 6.25 deep x 9.50 high | Approximate Shipping Weight: 6.00 lbs.